2013 are guarded by law and by SCIRP as a guardian. tuality outside of institutional religion (Hood Jr. et al., 2009). deity. Religiousness, by this definition, is a type of spirituality. creedal, but spirituality need not always include religiousness. terms, despite difficulties in researching such differences. changes that may occur throughout the college years. C. A. CREECH ET AL. attendance with a decrease in religious belief (Feldman, 1968). ality during the college years. responses range from never (coded 1), to many a day (coded 6). scale, with an alpha reliability of .90 (Ellison & Fan, 2007). scales: universality, prayer fulfillment, and connectedness. existential/meditative, α = .70) but perhaps, as Hatch et al. of beliefs and actions (Maltby & Day, 2001). 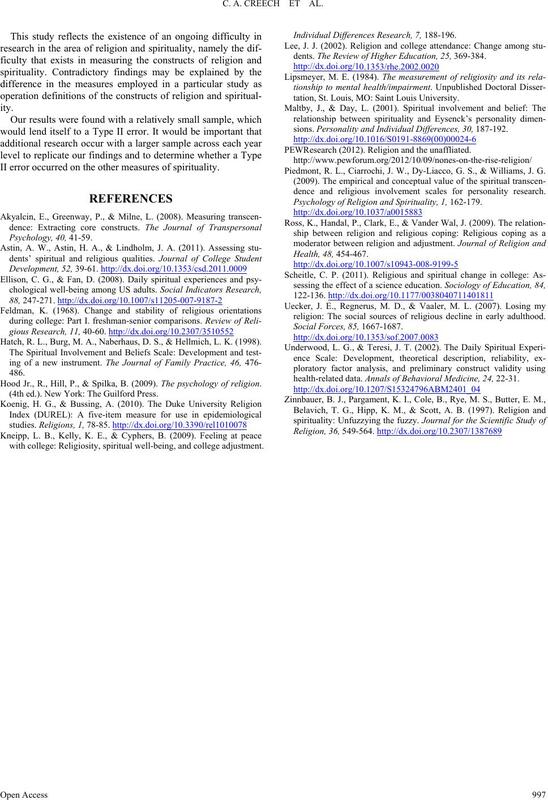 of religion (Ross, Handal, Clark, & Vander Wal, 2009). osity measures (r’s = .71 - .86). identified as spiritual, religious or both. other religion and spirituality measures. upper-class participants, with regard to ritual attendance. upper-class participants, with regard to religious attendance. class participants, with regard to religious attendance. the specific area of ritual and non-ritual attendance. more experiential and the other measures are more cognitive. II error occurred on the other measures of spirituality. Hatch, R. L., Burg, M. A., Naberhaus, D. S., & Hellmich, L. K. (1998). Hood Jr., R., Hill, P., & Spilka, B. (2009). The psychology of religion. (4th ed.). New York: The Guilford Press. 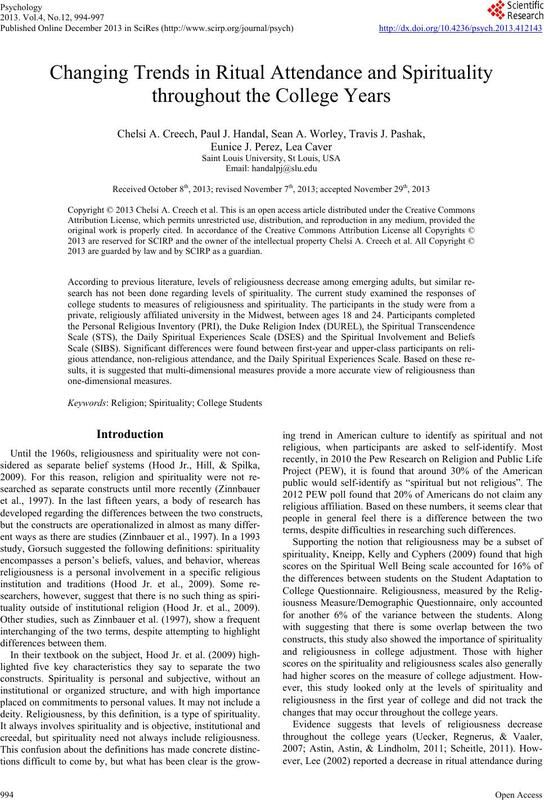 with college: Religiosity, spiritual well-being, and college adjustment. Individual Differences Research, 7, 188-196.
dents. The Review of Higher Education, 25, 369-384.
tation, St. Louis, MO: Saint Louis University. sions. Personality and Individual Differences, 30, 187-192. PEWResearch (2012). Religion and the unaffliated. 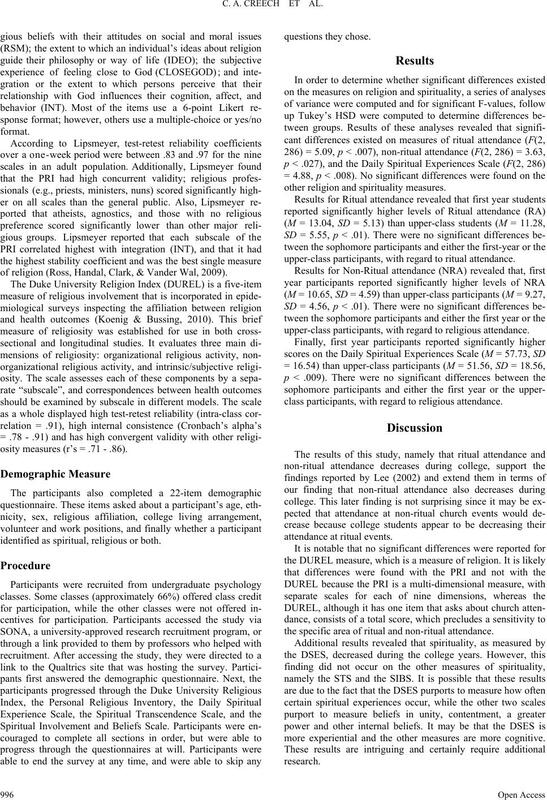 Piedmont, R. L., Ciarrochi, J. W., Dy-Liacco, G. S., & Williams, J. G.
dence and religious involvement scales for personality research. 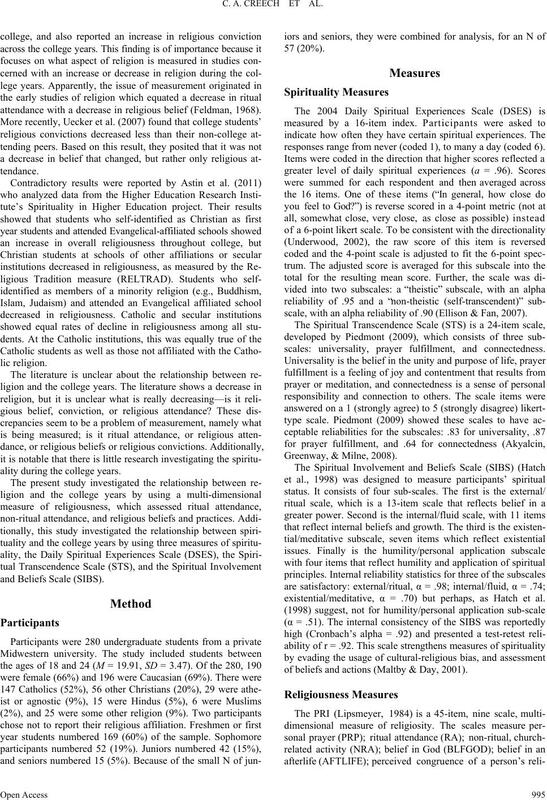 Psychology of Religion and Spirituality, 1, 162-179.
religion: The social sources of religious decline in early adulthood. health-related data. Annals of Behavioral Medicine, 24 , 22-31.